We will keep track of major news events in India and across the world through this live blog. Stay tuned for latest news and updates. Big news right now: Congress chief Rahul Gandhi has joined protesters from the SC/ST and Dalit communities at Delhi’s Jantar Mantar where the agitators are demanding the release of all their leaders arrested under criminal charges after April’s Bharat Bandh. Addressing the protesters, Gandhi says the BJP and Prime Minister Narendra Modi want to “marginalise” the weaker sections. The protesters are also demanding the arrest of all those involved in atrocities against Dalits and for the government of Madhya Pradesh to immediately make a public statement in line with the one made by Rajasthan CM Vasundhara Raje and announce that cases of atrocities against Dalits will be scrutinised on priority basis and those found arrested without valid reasons shall be released without any further delay. Congress chief Rahul Gandhi addressed Dalit protesters at Jantar Mantar. “Prime Minister Narendra Modi wants Dalits to remain marginalised. If Modi had place for Dalits in his heart, his policies would have shown it by now… PM Modi had written in one of his books that it feels good when the house has been cleaned by a Dalit. I assure you, the Congress will not let the SC/ST Act to be diluted,” he said. Rahul Gandhi also took a dig at the BJP’s campaign slogan for 2019, ‘Saaf Neeyat, Sahi Vikas’ (Good Intention, Right Development), saying the PM doesn’t have ‘saaf neeyat’. Rahul Gandhi with Sitaram Yechury at Jantar Mantar agitation organised by Telangana-based group Mahadika Reservation Vikas Samiti. Among the major demands of Dalit organisations on protest is the release of leaders who were arrested under criminal charges after the Bharat Bandh held in April and arrest of all those involved in atrocities against Dalits. They also want the government of Madhya Pradesh to immediately make a public statement in line with the one made by Rajasthan CM Vasundhara Raje and announce that cases of atrocities against Dalits will be scrutinised on priority basis and those found arrested without valid reasons shall be released without any further delay. Dalit Protests at Jantar Mantar | Congress chief Rahul Gandhi has joined protesters from the SC/ST and Dalit communities at Delhi’s Jantar Mantar where the agitators are demanding the release of all their leaders arrested under criminal charges after April’s Bharat Bandh. Also present at Jantar Mantar is CPM General Secretary Sitaram Yechury. A graduate from Banaras Hindu University, he was born in Ballia. Interestingly, he was a close aide of former PM Chandra Shekhar, who served on the post for about 8 months. For the BJP to have conceded the Rajya Sabha Deputy Chairman's post to Nitish Kumar's JD(U) is borne both out of compulsion and foresight. It's an assurance of sorts for present and potential allies. Union Minister Arun Jaitley is now speaking in the Rajya Sabha and started off by pointing the irony in the tradition of the Deputy Chairman being seated next to the Leader of Opposition. “But this also means that you (Harivansh) will also be looking at us,” says Jaitley, evoking laughter from the Upper House. Prime Minister Narendra Modi is now addressing the Rajya Sabha and begins by congratulating JD(U) leader Harivansh for being elect as the Deputy Chairman of the House. The PM has also extended a warm welcome to Union minister Arun Jaitley, who is attending the proceedings in the Rajya Sabha for the first time after undergoing a renal transplant in May. 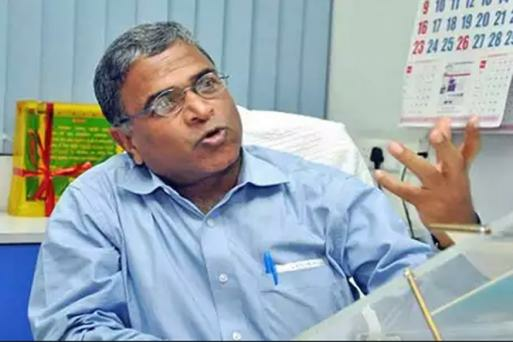 BREAKING | JD(U) leader and NDA nominee Harivansh has defeated UPA candidate BK Hariprasad by 20 votes to be elected the new Rajya Sabha Deputy Chairman. As per the final tally, Harivansh won 125 votes while Hariprasad polled 105. Harivansh has now taken his position next to Leader of Opposition Ghulam Nabi Azad. Giving the welcome address to the winning candidate, Azad says he hoped Harivansh would be impartial in his new role. “I would request the Deputy Chairman of the Rajya Sabha to look more towards Left and left of Centre as we (opposition) needs more nourishment,” Azad said. 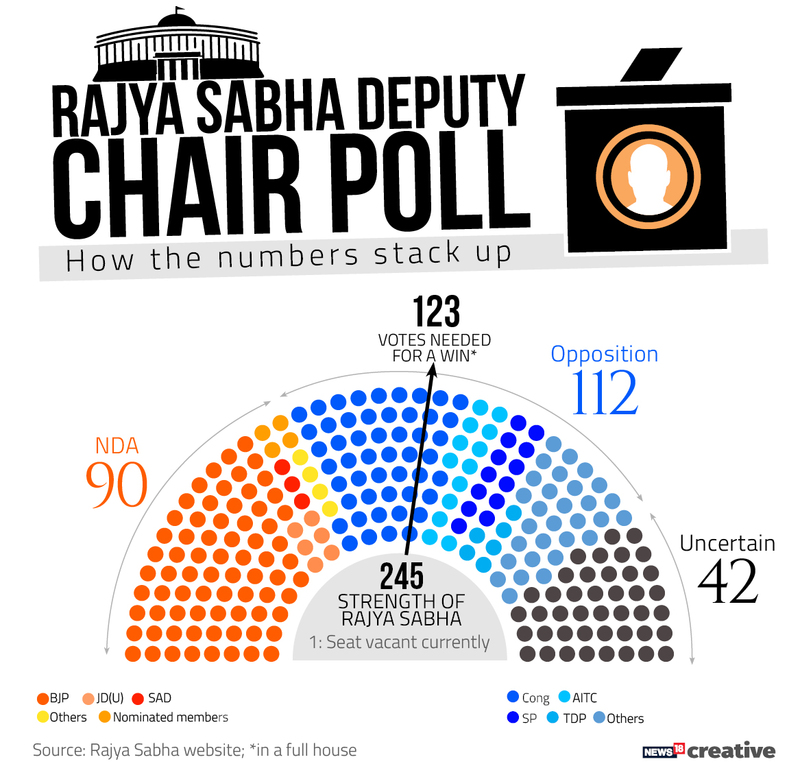 Subject to correction, the current tally stands at 122 votes for NDA nominee Harivansh, 98 for UPA candidate BK Hariprasad while two have abstained in the election for Rajya Sabha Deputy Chairman. BREAKING | Voting is underway for the post of Rajya Sabha Deputy Chairman and Chairman Venkaiah Naidu is asking for the aisles to be cleared. Secretary General of the Rajya Sabha is now explaining the voting procedure to the members of Rajya Sabha who will elect a new Deputy Chairman. 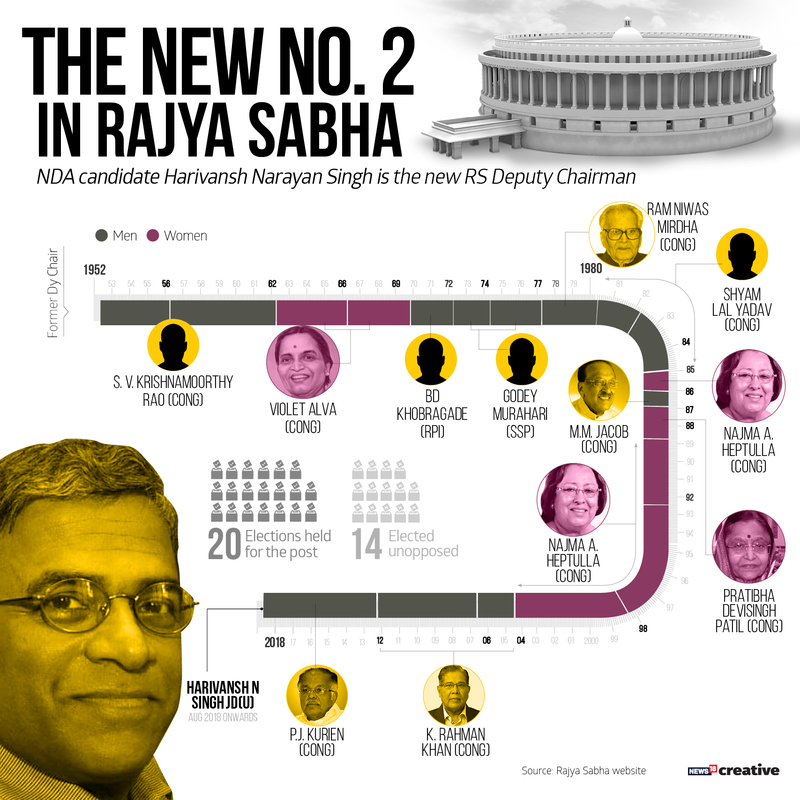 The support extended to the NDA by Biju Janata Dal makes its candidate Harivansh Singh’s prospects stronger. BJD president and Odisha Chief Minister Naveen Patnaik said his party will support the NDA candidate. The BJD will support the JD(U), which is backed by the NDA, since the two parties have emerged from the Jay Prakash Narayan movement, while the Congress candidate was the AICC in-charge of Odisha and vitriolic in his statements against the BJD, Patnaik said. The Rajya Sabha Deputy Chairman election will be held soon after the laying of papers. The post has been lying vacant since the retirement of PJ Kurien on July 1. The Rajya Sabha Deputy Chairman election will be held soon after the laying of papers. The post has been lying vacant since the retirement of PJ Kurien on July 1. The Congress is claiming support of various parties in the opposition camp, including Trinamool Congress, DMK, Left parties, SP, BSP, NCP and TDP. On the other hand, the ruling NDA is intact, with the Shiv Sena and Akali Dal extending their full support to the official nominee, besides also by independent parties like the AIADMK and the TRS. The two parties have 13 and 6 MPs, respectively. Union Minister Arun Jaitley attended the proceedings in the Rajya Sabha for the first time after undergoing a renal transplant in May. Jaitley, who is also the Leader of the Upper House, was holding the charge of Finance and Corporate Affairs Ministries. He underwent a renal transplant on May 14 and on the same day, his ministerial charges were given to Piyush Goyal on an interim basis. Rajya Sabha members would be voting to elect the Deputy Chairperson today. Who is NDA Nominee Harivansh Singh | A Rajya Sabha member from JDU since 2014, Harivansh Singh has been a veteran journalist. The 62-year-old was at the helm of ‘Prabhat Khabar’, a Hindi newspaper based in Jharkhand. He is credited to have brought the paper back from the dead when he took over as its editor during the year 1989. His paper is widely known for reporting relentlessly on the fodder scam starting from 1992. Despite being a first-time parliamentarian, Singh possesses a clean image and has the grit of a veteran journalist. A graduate from Banaras Hindu University, he was born in Ballia. Interestingly, he was a close aide of former PM Chandra Shekhar. He has also been an aide of renowned socialist Jai Prakash Narayan, someone who is credited to have influenced Singh’s life. Choosing Singh as their candidate puts across a very important message from the BJP’s side. With things hitting a rough patch with the BJP-JDU combination in Bihar, getting Singh on the pedestal is being seen as an ice breaker and maybe a game changer. A keen contest is on the cards Harivansh Singh and Hariprasad. The numbers, however, appear stacked in favour of the ruling coalition which claims the support of 126 members in the Upper House, which has an effective strength of 244 MPs. The effective strength is likely to come down as the Aam Aadmi Party said it will boycott the elections, upset at not being approached for support by Congress president Rahul Gandhi. Voting in the Rajya Sabha to elect a new Deputy Chairman will be held shortly, with NDA nominee Harivansh Narayan Singh at a clear numerical advantage following the decision to abstain by Arvind Kejriwal’s AAP and Jagan Mohan Reddy’s YSR Congress. The latest to back Singh was BJD president and Odisha Chief Minister Naveen Patnaik, who said his party will support the NDA candidate over opposition nominee BK Hariprasad in the election to the post of Rajya Sabha deputy chairman. “Bihar Chief Minister Nitish Kumar had spoken to me and our party will support the JD(U) candidate in the Rajya Sabha's deputy chairman election,” Patnaik told reporters on his return from Mumbai. The BJD will support the JD(U) since the two parties have emerged from the Jay Prakash Narayan movement, while the Congress candidate was the AICC in-charge of Odisha and vitriolic in his statements against the BJD, Patnaik said. He also said that a number of political leaders, including Prime Minister Narendra Modi and BJP chief Amit Shah, had spoken to him in this regard.